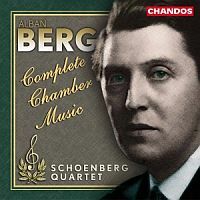 This disc of Berg’s complete output for chamber music was originally issued by Chandos in 2001, as part of the Schoenberg Quartet’s traversal of all the chamber music written by the Second Viennese School. It included many rarities and arrangements – here, for instance, is the only currently available recording of Berg’s own transcription of the last of his early and passionate Altenberg-Lieder for a quartet of piano, harmonium, violin and cello, made for performance at an influential private musical society, established by Schoenberg in 1900 in order to play and promote the revolutionary music of himself, his friends and associates, away from the catcalls of the conservative Viennese public. This disc contains some of the most heartfelt and openly passionate music from a musical school often regarded as forbidding and abstract.